To find out how you can help, please contact us. To improve the health (mind, body and spirit) of the people of central Arkansas by assuring access to quality, culturally-sensitive care and health education along the continuum, working in collaboration with local communities and resources. The clinics are equal opportunity agencies and do not discriminate on the basis of race, color, nationality, origin, gender, religion, sexual orientation, age, disability or residency. We are a free community clinic for the medically uninsured. Qualifying patients are typically individuals with no insurance or those ineligible for a government sponsored plan such as Medicaid or Medicare. Physicians and nurses are available at this clinic. Eligibility for services is established at an initial visit and every three months thereafter. Our clinic is open every Monday from 9:00 a.m. until all the patients are seen. No appointments are made at this clinic. Patients are seen on a first-come, first-served basis. When a physician cannot be in the clinic, a nurse will be available. The Clinic will be closed during hazardous weather conditions and all major Holidays. When the clinic is open on Mondays, please call 374-8852. Calls on other days may be made to 552-3241. We have a wonderful volunteer staff. They are what keep our clinic open and they always treat our patients with the utmost respect and a friendly smile. Prevention is always better than treatment. We encourage people to become active participants in managing their health. Our clinic has brochures and staff to provide clinical education. We fill prescriptions written by physicians in the St. Vincent Health System Community Health Clinics. We cannot fill other prescriptions through the clinics. The clinic does not stock and cannot prescribe any controlled substances, antidepressants or tranquilizers. St. Vincent Community Health Clinics reserves the right to terminate any service provided to individuals who misuse services or abuse staff. 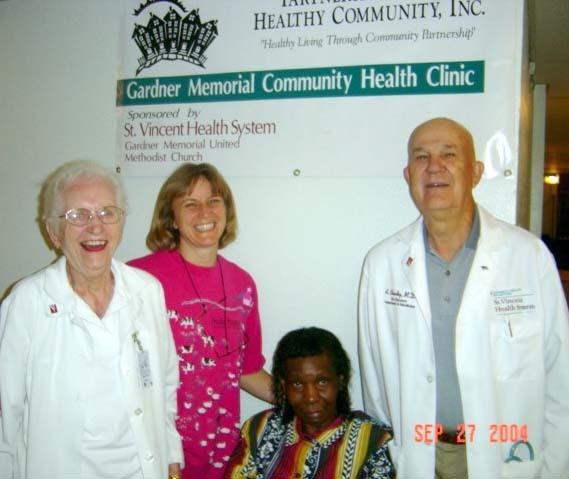 The professionals providing health care services at the Gardner Memorial Community Health Clinic, sponsored by St. Vincent Health System, do so on a voluntary basis and are not subject to civil suits.